Corona Contracts are leading commercial blinds suppliers in the North West. We specialise in supplying and installing blinds in a variety of institutions and workplaces. Our commercial blinds supply and installation service provides bespoke designs, delivering exactly what is required in each specific environment. With many successful projects carried out in Lancashire, Cumbria, Cheshire, Merseyside, Greater Manchester, Preston, Liverpool, the North West and throughout the UK, we have all the flexibility and reliability that is required from a professional contractor. Over our many years of operation we have worked with clients in a wide range of private and public sectors. Based in Preston, our experienced team carries out the full process required to create your ideal blinds solution. From the start, our designers will help you identify the the needs of your specific project both aesthetic and practical. We can take plans that you have already had drawn up by architects or interior designers and help you turn them into reality, or work with you from the start to create bespoke designs. Our experience as commercial blinds suppliers for a range of clients means that we can take into account the specific requirements of each of our customer’s businesses. From implementing anti-ligature systems, as required in schools or medical buildings, to printing custom designs onto fabrics to reflect your brand identity. As we also manufacture your blinds ourselves, we have complete control, enabling us to plan and build the perfect solution for you keeping to the cost we’ve quoted and timeframes we’ve agreed. Our workshop has a team of technicians who use our extensive stock of Mottura components to engineer blinds systems that are built to last. With a wide range of fabrics available as well as our custom printing service, we can create the look you want in partnership with the functionality you need. 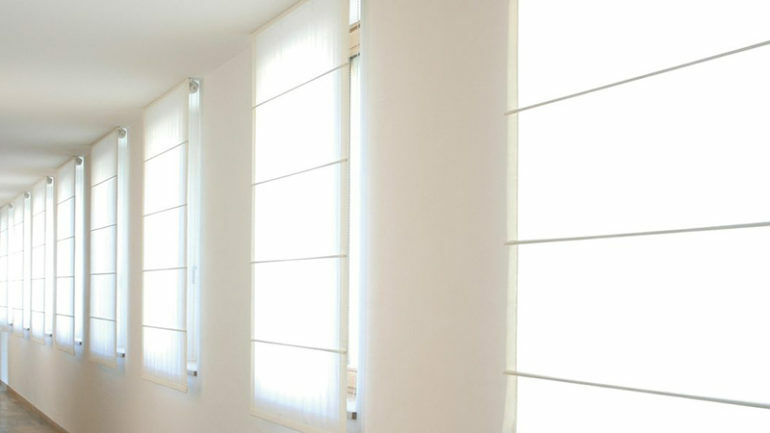 Ultimately, blinds are constructed to the correct specification on time and on budget. Our expertise in creating bespoke blinds systems also allows us to find advanced and innovative solutions to your needs.We can create motorised systems which enable you to remotely or automatically adjust the lighting in a room. This is especially useful for blinds in hard to reach places and we have additional systems specifically for skylights and slanting windows. Where necessary we can implement blackout systems which have the further benefits of heat insulation and sound dampening. We are renowned across the North West for carrying out work in the most accommodating manner we can. We are dedicated to completing projects on time and on budget, so you can carry on with your normal business operations at the time expect. Naturally, we take precautions to keep your premises protected and tidy while we work and we always clean up after ourselves. At Corona Contracts we always use the best quality components, such as Mottura products. Their softshade curtain tracks are an excellent choice for reducing glare and solar heat while still maintaining light in the office. Another option is Mottura’s blackout blinds which will eliminate outside light- excellent for rooms in which presentations are done on-screen or on an overhead projector. Again, these are customisable based on your specifications and can be specifically developed for every type of window, including sloping skylights. Our panel blind systems might suit your office or conference room, and we can create bespoke versions of these products which boast all the functionality to go along with their aesthetic attributes. Our blinds can be controlled with the “M2Net” system, a range of products and software developed by Mottura for Automation Control which can be operated from a PC, tablet or smartphone. To find out more about our Mottura rollerblinds systems, click here.